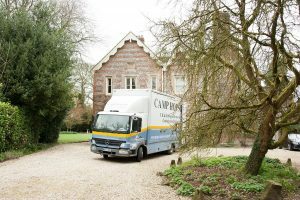 Removals in Reading go better, safer, quicker and more efficiently with Camp Hopson. Owing to the fact that we’ve been moving people for nearly a century, we’ve built up a knowledge and an expertise that only time and dedication can bring. For every moving problem, we’ve got a solution, and we’ll do our utmost at every critical juncture to ensure that your relocation isn’t stressful or exhausting. Our complete packing/unpacking service makes the process even easier. We’ve got all the right packaging for delicate furniture, works of art and musical instruments, including grand pianos. We’re fully equipped, BAR-certified (British Association of Removers) and committed to giving you a move that’s worlds away from the gruelling slogs you’ve experienced in the past. We move people every day, but we always keep in mind that, for you, it’s a potentially unsettling and worrying experience. Consequently, we do whatever’s necessary to keep you calm and untroubled – and you can talk to us whenever you want; we’re here to allay your fears and keep everything on track. When you first get in touch with us, we’ll arrange for one of our estimators to pay you a call. All the details of your move will be gathered and noted and then a detailed but clear and accurate quotation will be supplied to you. Already, you’ll start noticing the Camp Hopson difference – the dependability, reliability and conscientiousness of all our personnel will be apparent from the start, putting your mind at rest and letting you get on with living your life. Storage in Reading is plentiful, but our facilities are especially good because we can accommodate all kinds of requirements, even if you only want to keep a handful of possessions with us. And it doesn’t matter whether your needs are long- or short-term; we’ll work out a storage plan that fits the bill. If you’re downsizing and have found yourself with a glut of belongings but nowhere to put them, keeping them with us gives you breathing space and enough time to work out what to do. Our facilities are safe and secure. We carefully categorise all items and then issue you with an inventory. Not all removal companies in Reading are up to the standards of Camp Hopson. Get in touch today and we’ll get straight to work on moving you without the stress.